Ecological Applications presents a broad range of methods and techniques for managing environmental sustainability. This book examines ecological theory at the individual, populations, and community levels, and is an excellent resource for anyone looking to improve the health of their local ecosystems. Colin Townsend obtained his DPhil at Sussex before taking up teaching positions at Oxford University and the University of East Anglia. In 1989 he moved from the UK to New Zealand, where he was appointed Chair of Zoology at the University of Otago; he is now Director of the Ecology, Conservation and Biodiversity Research Group at Otago. 1. Introduction – Humans, Nature, and Human Nature. 1.1.1. Homo sapiens – Just Another Species?. 1.1.2. Human Population Density and Technology Underlie Environmental Impact. 1.2.1. The Scale of the Biodiversity Problem. 1.2.2. Biodiversity, Ecosystem Function and Ecosystem Services. 1.2.3. Drivers of Biodiversity Loss – The Extinction Vortex. 1.2.4. Habitat Loss – Driven from House and Home. 1.2.5. Invaders – Unwanted Biodiversity. 1.2.6. Overexploitation – Too Much of a Good Thing. 1.2.7. Habitat degradation – Laying Waste. 1.2.8. Global climate change – Life in the Greenhouse. 1.3. Toward a Sustainable Future?. 1.3.1. 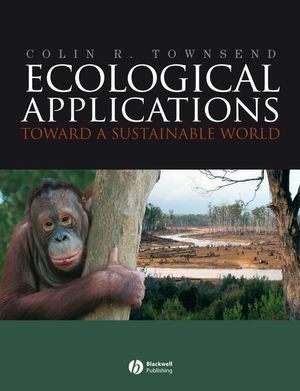 Ecological Applications – to Conserve, Restore, and Sustain Biodiversity. 1.3.2. From an Economic Perspective – Putting a Value on Nature. Part 1: Ecological Applications At The Level Of Individual Organisms. 2. Ecological Applications of Niche Theory. 2.2. Unwanted Aliens – Lessons from Niche Theory. 2.2.1. Ecological Niche Modeling – Predicting Where Invaders will Succeed. 2.2.2. Are we Modeling Fundamental or Realized Niches?. 2.2.3. When Humans Disrupt Ecosystems and Make it Easy for Invaders. 2.3. Conservation of Endangered Species – Each to Its Own Niche. 2.3.1. Monarch’s Winter Palace Under Siege. 2.3.2. A Species off the Rails – Translocation of the Takahe. 2.4. Restoration of Habitats Impacted by Human Activities. 2.4.1. Land Reclamation – Prospecting for Species to Restore Mined Sites. 2.4.2. Agricultural Intensification – Risks to Biodiversity. 2.4.3. How Much Does it Cost to Restore a Species?. 2.4.4. River Restoration – Going with the Flow. 3. Life-history Theory and Management. 3.1. Introduction – Using Life-history Traits to Make Management Decisions. 3.2. Species Traits as Predictors for Effective Restoration. 3.2.1. Restoring Grassland Plants – A Pastoral Duty. 3.2.2. Restoring Tropical Forest – Abandoned Farmland Reclaimed for Nature. 3.3. Species Traits as Predictors of Invasion Success. 3.3.1. Species Traits Predict Invasive Conifers. 3.3.2. Invasion Success – The Importance of Flexibility. 3.3.3. Separating Invasions into Sequential Stages – Different Traits for Each?. 3.3.4. What We Know and Don’t Know About Invader Traits. 3.4. Species Traits as Predictors of Extinction Risk. 3.4.1. Niche Breadth and Flexibility – Freshwater and Forest at Risk. 3.4.2. When Big isn’t Best – r/K Theory, Harvesting, Grazing and Pollution. 3.4.3. When Competitiveness Matters – CSR Theory, Grazing and Habitat Fragmentation. 4. Dispersal, Migration and Management. 4.1. Introduction – Why Species Mobility Matters. 4.2. Migration and Dispersal – Lessons for Conservation. 4.2.1. For Whom the Bell Tolls – The Surprising Story of a South American Bird. 4.2.2. The Ups and Downs of Panda Conservation. 4.2.3. Dispersal of a Vulnerable Aquatic Insect – A Damsel in Distress. 4.3. Restoration and Species Mobility. 4.3.2. Bog Restoration – Is Assisted Migration Needed for Peat’s Sake?. 4.4. Predicting the Arrival and Spread oInvaders. 4.4.1. The Great Lakes – A Great Place for Invaders. 4.4.2. Lakes as Infectious Agents. 4.4.3. Invasion Hubs or Diffusive Spread?. 4.4.4. How to Manage Invasions under Globalization. 4.5. Species Mobility and Management of Production Landscapes. 4.5.1. Squirrels – Axeman Spare that Tree. 4.5.2. Bats – Axeman Cut that Track. 4.5.3. Farming the Wind – The Spatial Risk oPulverizing Birds. 4.5.4. Bee Business – Pollination Services of Native Bees Depend on Dispersal Distance. Part 2: Applications at the Level of Populations. 5. Conservation of Endangered Species. 5.1. Dealing with Endangered Species – A Crisis Discipline. 5.2. Assessing Extinction Risk from Correlational Data. 5.3. Simple Algebraic Models of Population Viability Analysis. 5.3.1. The Case of Fender’s Blue Butterfly. 5.3.2. A Primate in Kenya – How Good are the Data?. 5.4. Simulation Modeling for Population Viability Analysis. 5.4.1. An Australian Icon at Risk. 5.4.2. The Royal Catchfly – A Burning Issue. 5.4.3. Ethiopian Wolves – Dogged by Disease. 5.4.4. How Good is Your Population Viability Analysis?. 5.5.1. Genetic Rescue of the Florida Panther. 5.5.2. The Pink Pigeon – Providing a Solid Foundation. 5.5.3. Reintroduction of a ‘Red List’ Plant – The Value of Crossing. 5.5.4. Outfoxing the Foxes of the Californian Channel Islands. 5.6. A Broader Perspective of Conservation – Ecology, Economics and Sociopolitics All Matter. 5.6.1. Genetically Modified Crops – Larking About with Farmland Biodiversity. 5.6.2. Diclofenac – Good for Sick Cattle, Bad for Vultures. 6.1.1. One Person’s Pest, Another Person’s Pet. 6.2.3. From Blunderbuss to Surgical Strike. 6.2.4. Cut off the Enemy’s Reinforcements. 6.2.5. Changing Pest Behavior – A Propaganda War. 6.2.6. When Pesticides go Wrong – Target Pest Resurgence and Secondary Pests. 6.2.7. Widespread Effects of Pesticides on Nontarget Organisms, Including People. 6.3.1. Importation Biological Control – A Question of Scale. 6.3.2. Conservation Biological Control – Get Natural Enemies to do the Work. 6.3.3. Inoculation Biological Control – Effective in Glasshouses but Rarely in Field Crops. 6.3.4. Inundation Biological Control – Using Fungi, Viruses, Bacteria and Nematodes. 6.3.5. When Biological Control Goes Wrong. 6.4. Evolution of Resistance and its Management. 6.5. Integrated Pest Management (IPM). 6.5.1. IPM against Potato Tuber Moths in New Zealand. 6.5.2. IPM against an Invasive Weed in Australia. 7.1.1. Avoiding the Tragedy of the Commons. 7.1.2. Killing Just Enough – Not Too Few, Not Too Many. 7.2. Harvest Management In Practice – Maximum Sustainable Yield (MSY) Approaches. 7.2.1. Management by Fixed Quota – Of Fish and Moose. 7.2.2. Management by Fixed Effort – Of Fish and Antelopes. 7.2.3. Management by Constant Escapement – In Time. 7.2.4. Management by Constant Escapement – In Space. 7.2.5. Evaluation of the MSY Approach – The Role of Climate. 7.2.6. Species that are Especially Vulnerable When Rare. 7.2.7. Ecologist’s Role in the Assessment of MSY. 7.3. Harvest Models that Recognize Population Structure. 7.3.1. ‘Dynamic Pool Models’ in Fisheries Management – Looking After the Big Mothers. 7.3.2. Forestry – Axeman, Spare which Tree?. 7.3.3. A Forest Bird of Cultural Importance. 7.4. Evolution of Harvested Populations – Of Fish and Bighorn Rams. 7.5. A Broader View of Harvest Management – Adding Economics to Ecology. 7.6. Adding a Sociopolitical Dimension to Ecology and Economics. 7.6.1. Factoring in Human Behavior. Part 3: Applications at the Level of Communities and Ecosystems. 8.2. Managing Succession for Restoration. 8.2.1. Restoration Timetables for Plants. 8.2.2. Restoration Timetable for Animals. 8.2.3. Invoking the Theory of Competition–Colonization Trade-offs. 8.3. Managing Succession for Harvests. 8.3.1. Benzoin ‘Gardening’ in Sumatra. 8.3.2. Aboriginal Burning Enhances Harvests. 8.4. Using Succession to Control Invasions. 8.5. Managing Succession for Species Conservation. 8.5.1. When Early Succession Matters Most – A Hare-Restoring Formula for Lynx. 8.5.2. Enforcing a Successional Mosaic – First Aid for Butterflies. 8.5.3. When Late Succession Matters Most – Range Finding for Tropical Birds. 8.5.4. Controlling Succession in an Invader-dominated Community. 8.5.5. Nursing a Valued Plant Back to Cultural Health. 9. Applications from Food-web and Ecosystem Theory. 9.2. Food-web Theory and Human Disease Risk. 9.3. Food Webs and Harvest Management. 9.3.1. Who gets Top Spot in the Abalone Food Web – Otters or Humans?. 9.3.2. Food-web Consequences of Harvesting Fish – From Tuna to Tiddlers. 9.4. Food Webs and Conservation Management. 9.5. Ecosystem Consequences of Invasions. 9.5.1. Ecosystem Consequences of Freshwater Invaders. 9.5.2. Ecosystem Effects of Invasive Plants – Fixing the Problem. 9.6. Ecosystem Approaches to Restoration – First Aid by Parasites and Sawdust. 9.7.1. Stopping Caterpillars Eating the Broccoli – So That People Can. 9.7.2. Managing Agriculture to Minimize Fertilizer Input and Nutrient Loss. 9.7.3. Constructing Wetlands to Manage Water Quality. 9.8. Ecosystem Services and Ecosystem Health. 9.8.1. The value of Ecosystem Services. 9.8.2. Ecosystem Health of Forests – With All their Mites. 9.8.3. Ecosystem Health in an Agricultural Landscape – Bats Have a Ball. 9.8.4. Ecosystem Health of Rivers – It’s What We Make It. 9.8.5. Ecosystem Health of a Marine Environment. Part 4: Applications at the Regional and Global Scales. 10.2.1. The Emu-wren – Making the Most of the Conservation Dollar. 10.2.2. The Wood Thrush – Going Down the Sink. 10.2.3. The Problem With Large Carnivores – Connecting With Grizzly Bears. 10.3.2. A Peruvian Forest Successional Mosaic – Patching a Living Together. 10.4. A Landscape Perspective on Pest Control. 10.4.1. Plantation Forestry in the Landscape. 10.4.2. Horticulture in the Landscape. 10.4.3. Arable Farming in the Landscape. 10.5.1. Reintroduction of Vultures – What a Carrion. 10.5.2. Restoring Farmed Habitat – Styled for Hares. 10.5.3. Old is Good – Willingness to pay for forest improvement. 10.5.4. Cityscape Ecology – Biodiversity in Berlin. 10.6. Designing Reserve Networks for Biodiversity Conservation. 10.6.1. Complementarity – Selecting Reserves for Fish Biodiversity. 10.6.2. Irreplaceability – Selecting Reserves in the Cape Floristic Region. 10.7.1. Marine Zoning – An Italian Job. 10.7.2. A Marine Zoning Plan for New Zealand – Gifts, Gains and China Shops. 10.7.3. Managing an Agricultural Landscape – A Multidisciplinary Endeavor. 11. Dealing with Global Climate Change. 11.2. Climate Change Predictions Based on the Ecology of Individual Organisms. 11.2.1. Niche Theory and Conservation – What a Shame Mountains are Conical. 11.2.2. Niche Theory and Invasion Risk – Nuisance on the Move. 11.2.3. Life-history Traits and the Fate of Species – For Better or for Worse. 11.3. Climate Change Predictions Based on the Theory of Population Dynamics. 11.3.1. Species Conservation – The Bear Essentials. 11.3.2. Pest Control – More or Less of a Problem?. 11.3.3. Harvesting Fish in Future – Cod Willing. 11.3.4. Forestry – A Boost for Developing Countries?. 11.4. Climate Change Predictions Based on Community and Ecosystem Interactions. 11.4.1. Succession – New Trajectories and End Points. 11.4.2. Food-web Interactions – Dengue Downunder. 11.4.3. Ecosystem Services – You Win Some, You Lose Some. 11.5. A Landscape Perspective – Nature Reserves Under Climate Change. 11.5.1. Mexican Cacti – Reserves in the Wrong Place. 11.5.2. Fairy Shrimps – A Temporary Setback.